the new stamps are ready for the picking! Click on the link and go to "what's new"! have a terrific weekend, and happy shopping!!! Melanie, this is fabulous! I am so stoked for this set! ALL your samples are amazing! I love the first one with the clear vase! It's such a perfect design so I don't have to be a genius at coloring! Thank you for that!! Day 4: "Winter Wings" and "Labeled with Love"
First up we have today's Free with Three set from Gina "Labeled with Love", which coordinates with the new Labels 14 dies. You get two label images and greetings to fit inside! I thought this curvy shape was too cool so I thought I'd make a background out of it to match the tag by stamping it in rows in Vivid Coffee Bean across Pure Luxury Ocean Mist. Next I decided I would try free cutting around the labels on one end of the mat to make this undulating border. I liked! Next I grabbed a large oval punch and punched out the centers of all the labels I could reach LOL! Love this reveal in the center of each of the Chocolate Brown mat below! Last I added some satin ribbon, a label on white with more of the Ocean Mist in the middle, all layered onto a White base. I was so excited how this turned out: Vintage Mod??!! Finally we have Asela's "Winter Wings". I chose the blue jay image, I am really fond of their colors and markings. After coloring with Copics, using pale shades of blue to accentuate the white areas, I colored some adhesive pearls with a Cardinal Copic to embellish the punched ferns and bring them image beyond the borders of the Labels 1 die cut mat. The entire team would like to cordially invite each of you to our release party tomorrow night (Thursday September 30.) 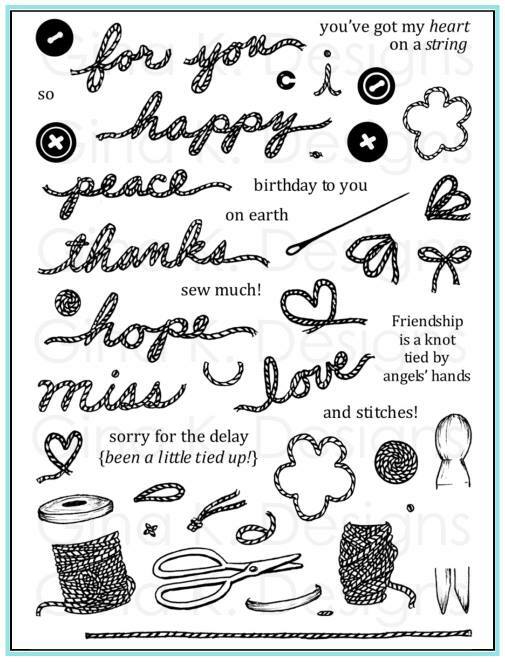 We'll have contest questions, challenges, chatter, and lots of samples with the new stamp sets to share during the party. Please make plans to join us from 7-10 central on StampTV! I will be back before the party to announce a winner from this post, did you enter?? Day 3: "Funny Farm" and "Tea Time"
I paper pieced it with a solid distressed piece of Basic Grey Lemonade, it is perfect for the patina of antique china. Swipe a a darker marker over the edges and detail to give shadows and contour. TIP: I also stamped them in black onto the white paper, colored the handle brown and glued my teal pieces over them, this way you don't have to worry about trimming the handle. Don't forget to make a little shadow underneath each, here I used W-3 Warm Gray. For Asian inspired cards I always try to use a simple, serene layout, so I just divided the fancy background DP from the same pack into sections to go above and below and adhered them all to a Pure Luxury Lipstick Red base. I am completely out of all my paper and sateen flowers now, so, I colored and cut out a few of my blooms from my new "Buds and Vases" to embellish the top and bottom! A terrific match for the DP, swirls on the tea pot, and girly theme. Next is Gina K 's "Funny Farm". Oh, the zany antics you'll stamp up with these farm critters! I had to start with this cute little pig and the sentiment "...hogs and kisses" so I pulled out two chipboard "x"s I had, sponged them with black and popped up two little stamped pigs I colored with Copics in between, XOXO! Base is Pure Luxury Innocent Pink and tag is Soft Sand. I used 5/8" black gingham and a button from the pink assortment tied with hemp. Sides of the white mat are stamped with "In Stitches". The entire team would like to cordially invite each of you to our release party this Thursday night, September 30. 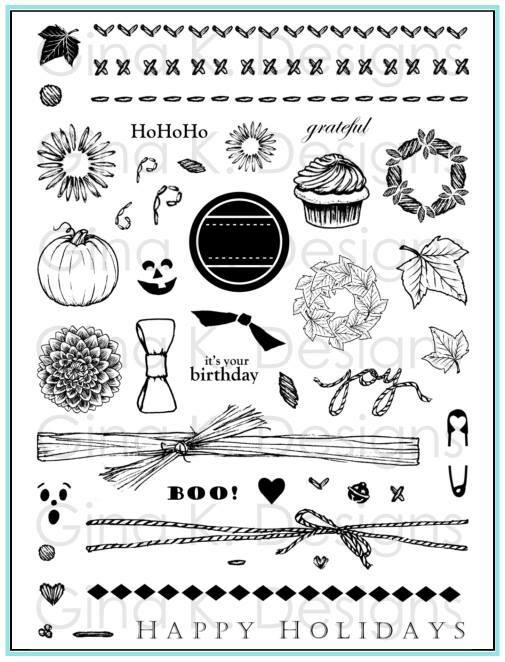 We'll have contest questions, challenges, chatter, and lots of samples with the new stamp sets to share during the party. Please make plans to join us from 7-10 central on StampTV! My giveaway for the new "Buds and Vases" set is still going on, so don't forget to enter here if you have not already! Day 2 "Fanciful Fall" and "So Groovy"
Hello, it's Day 2 of our sneak peeks, thank you so much for all yor wonderful comments yesterday!! First up we have Theresa Momber's "Fanciful Fall", chock full of beautiful images that can be elegant or spookified (my word) in a snap! I love making stuff for Halloween, it is such a fun holiday for decorating and crafting! I started with these little pumpkins, their curling stems are so bibiddy boppidy boo! I really appreciate that she left them plain to use for general fall cards but also a face image you can choose to add, it gives them a lot more versatility before and after October 31st! I masked the pumpkin and stamped the twisting grass behind them to give it depth and make the scene complete. I mounted these Black Onyx and Sweet Mango CS and added a ribbon treatment using both black gingham and stitched ribbon held together with an orange Basic Grey brad. TIP: When you use a stamped image that is round, a round embellishment somewhere else on your project like a brad or button is a perfect choice! 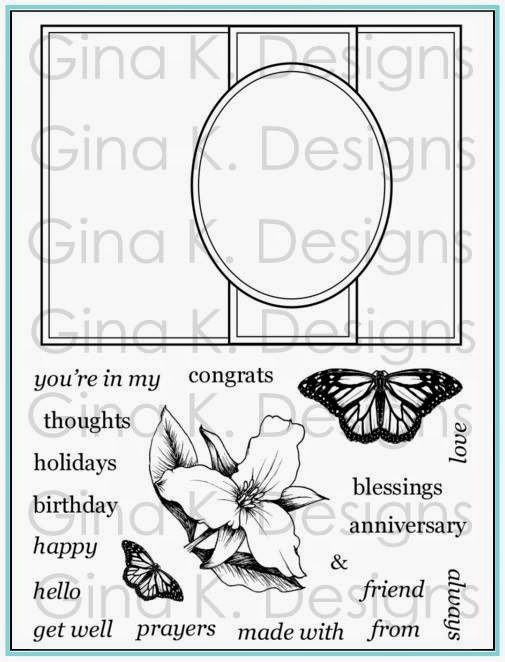 After stamping the greeting I embossed the little wavy border to add dimension and draw your eye to the sentiment. Pumpkins are colored with Copics from light to dark: Honey, Orange and Lipstick Orange, stems are Pea Green and Moss. Shadow underneath is W-3. I have one more card to share with this set today, because she gave us this fabulous any time of year whimsical tree silhouette. I inked it up with Memento Rich Cocoa, Cataloupe, Pear Tart, and Potters Clay markers and stamped it onto white. Isn't that a great look? I die cut it with a Rectangle Nestability and then sponged a little wild honey ink around the edges before removing the die. I layered it onto Pure Luxury Chocolate Brown, Ivory (embossed with Leafy Branch) Sweet Corn, embossed with Herringbone, and finally Fresh Asparagus and Grass Green. I kept if free of any prints and just focused on colors and textures. Last I added a little orange button sun and a couple more to the bottom over the green stitched ribbon for balance. Ahh, I just love fall, and I love this set! Next we have Tami Mayberry's So Groovy. In the 80's, nothing said I love you quite like a mix tape! So after coloring her cassette player (the heart is a separate stamp in the set that I stamepd in Vivid Brick over each of the speakers) and added the sentiment, and pairing it with this perfect cassette patterned paper from Cosmo Cricket Boyfriend pack, I had to craft my own tape out of paper! Start with a Black Onyx rectangle, and punch the top corners with a corner rounder. Punch a 1/2 inch circle on the side and use a Cropodile or circle punch to punch some small holes at the bottom. Cut out a rectangle for the middle with a craft knife and put a layer of acetate behind it for the clear window (I have one here but it's a little hard to see in the pic.) To make the little spool gear spinny thing (also my words!) I punched a flower out of white paper and then put the outside of what I'd punched (not the punched flower) behind the 1/2" round window so you only see the little white parts, too cool! 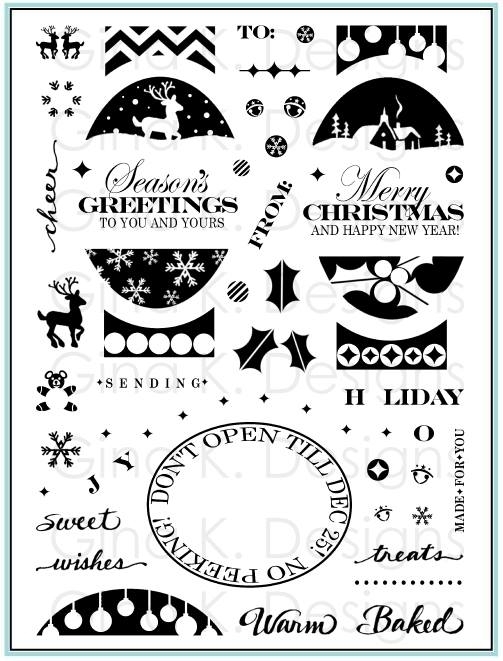 you could just add little strips of white to poke out, spacing them evenly.... Last add a strip of white with "Mix Tape" in your own writing! Pop it up for dimsnion. Mount it on Black Onyx and Red Hot CS and this card is sure to bring back some memories! FINALLY LOOK at this gorgeous pile of rubber that I cut out myself...NOT! If you haven't already heard, that perfect trimming you see will now done FOR YOU on all our new releases from this day forward, courtesy of Gina K Designs! It makes for a fantastic close trim and sets that are "peel and stick", ready to get inked up as soon as your Gina K orders arrive! 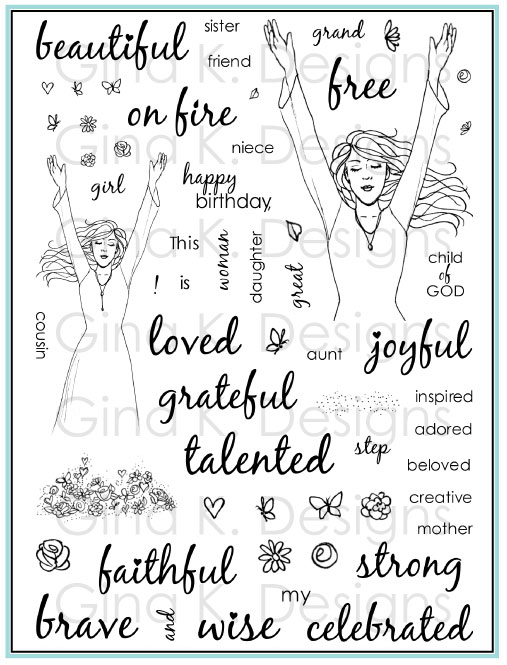 How's that for some a-ma-zing added value to the quality rubber stamps you already love? Yippeee!!!! Day 1 "Lovely Labels" and "Buds and Vases"
This first sample uses the glass vase, colored with pale aqua Copics, a cluster of stems(no masking!) and a cluster of flowers. I made a little tag out of one of the greetings and tied it around the top of the vase with some raffia. Special delivery, indeed! DP is Basic Grey Lemonade, stamped with "In Stitches" and layered onto Innocent Pink. Gingham and button are also Pure Luxury. Now, there are SO many ways to alter the different containers so will you have even more than originally meet the eye when you see the whole set Thursday night after our party! Here I used the same vase, but this time I inked up just the outside of the image (omitting the middle which makes it look clear) and stamped it onto a Basic Grey Junebug print. Now it looks like a beautiful painted ceramic vase! Base is Red Hot and gingham and button are Pure Luxury. Now to show how well these containers work with the "A Year of Flowers" blooms, I created a Christmas card, stamping and masking three poinsettias from that set, cut them out, and then stamped the pot from"Buds and Vases" onto a piece of distressed looking solid colored DP from the Basic Grey Lemonade pack, those solids are perfect for old, shabby chic pots! Adhere the flowers overlapping the top of the pot and then trace the underside of the leaves and one side of the pot with a slightly darker marker to give it dimension and shadows. Easy peasy! Poinsettias are colored with Copics and traced with a Stardust pen. The label is from Nina Brackett's new "Lovely Labels 2", images that custom fit Nestabilities Labels 14, 15 and 16 (more about her new set in a minute!) stamped in cranberry ink on White and colored with a pink Copic for contrast in the middle. Last I matted these onto Basic Grey Eskimo Kisses DP and Cranberry Tart Pure Luxury and added some buttons and lace using glue dots. I added one of her sentiments and embellished it with this popped up spray of blooms, also from "Buds and Vases". These flowers are also one image, so no masking! Don't they complement the floral pattern on the label beautifully? Card is finished with some 5/8" gingham and a Pure Luxury red button. Now I wasn't planning on these originally for the preview, but your many comments about the jar snippet (yup, I drew it and it's in this new set!) 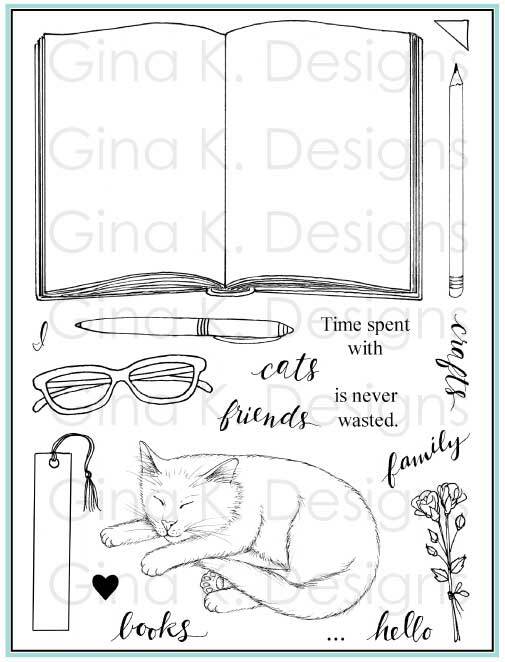 on Gina's blog last week inspired me to go to stamp up several jars and get busy filling with them different Gina K Designs sets: shells, strawberries, and caterpillars, oh my! A few were possibilities I hadn't really been thinking about yet, flowers came first LOL! I haven't had a chance to make them into cards with all the preview we are busy preparing for you this week, but you can see the style and scale of the jar is just as appropriate for flowers as it for sets like "Gifts from the Sea", "Have a Cookie", "A Year of Leaves", Gina's strawberries from "Enjoy the Sunshine ", Tami's "Happy Hearts", and I know many, many more! how's that for a versatile stamp? And, you can also see how you can color the top to make it look like it has a lid, I love that option! Want to win "Buds and Vases"? Leave me a comment below telling me which of the samples above is above is your favorite or what you would do with this set first! "Melanie Muenchinger is releasing a companion to her "A Year of Flowers" called "Buds and Vases", a die cut stamp set filled with brand new flowers and containers, this Thursday night, September 30 at 10 PM CST from Gina K Designs! Be sure to check out her sneak preview of the set on her blog and enter for a chance to win the set!" Then, come back here and leave a second comment with a link to your post so I know you did so! Thanks in advance for getting the word out to your readers (friends don't let friends miss out on stamps! ;) I will choose a winner from all the comments and post it here Thursday before the party! Thank you for visiting me today, more previews tomorrow! Melanie and Paul got married! Here's a fun pic of us doing a cheesy conga, tambourine and all! Of course I am mugging for the camera, but that sweet, humble man is looking at me. I just cherish his adoring look! What a guy! This photo is very bittersweet because if you look closely, there is a tiny scar on my right wrist. It is the only evidence on my body of a horrific car accident (a burn from the airbag, I was broadsided on the highway, forced off the road into a pole, my car flipped several times before landing on the southbound side of the freeway upside down, I was alone and kicked out the passenger window to get out ) that occurred just a few weeks before. And this last was probably one of the few very candid shots in our wedding album (sorry for the poor quality of both of these last pics, I had to take a pic of the pic!) One of my bridesmaids who got married just one month before we did (and I missed her wedding because I got in the accident I described above on the way there!) told me before my big day, "That ceremony and party go so fast. There will be SO many people there wanting to talk to you. Make sure the two of you take a moment to go talk reflect on how everything you've been planning for so long turned out, enjoy how beautiful everything looks, and how much you love each other." Well, that sounded like great advice to me! So we stole away to a corner of the ball room (but the photographer managed to sneak up on us even so!) Although I remember this moment I don't really remember what he was whispering to me exactly, but I am so glad she captured the look on my face and how I was feeling: overwhelmed with happiness and gratitude for all the blessings I 'd received and things to come. God bless, thanks for reading about my wonderful husband, have a great rest of your weekend! Crafts 'n Things Newsletter and something special! I am excited to tell you about a Breast Cancer project I have in the newest edition of the Crafts 'n Thing newsletter since Breast Cancer Awareness month is around the corner, using a couple of my favorite sets "The Best Things in Life" and "Little Tees"! 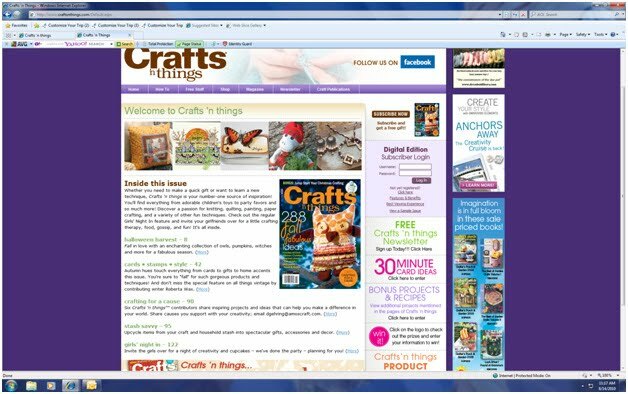 Be sure to sign up here, it's free and the newsletter is emailed directly to you with lots of crafting projects and tips! Click to see what's in this little tin, because the real fun's inside! (If you can't view that link, you may just need to sign up first.) This will be soem very happy mail in your inbox! As you'd expect, this issue is full of fall and holiday gift and home decor projects, for Halloween and Thanksgiving, some like nothing I've seen before! Definitely on my list of "to make"! Also, another project of mine that was featured in the current issue of Craft n Things (above) I donated as part of the ginormous blog candy Carolyn King is offering for the Heart to Heart Card Drive, which includes tons of free supplies from sponsors and handmade creations from a multitude of stampers you know, so be sure to look for all the details of that on her blog tomorrow! 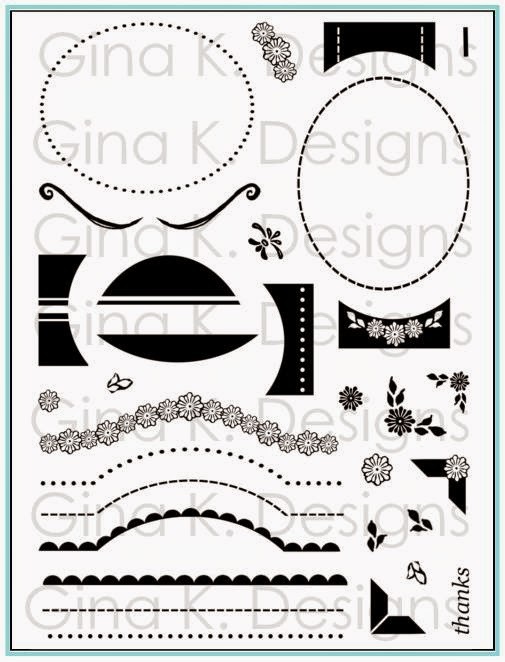 New Gina K Designs sneak peeks start tomorrow night, can't wait! Stamps were inked with Marvy Signature Series Blending blox in Shades of Green. It was also used for the sponging. My card stocks are Pure Luxury White and Black Onyx. My triangle that was made using the background stamp, had the flowers covered in TH Distress Stickles. 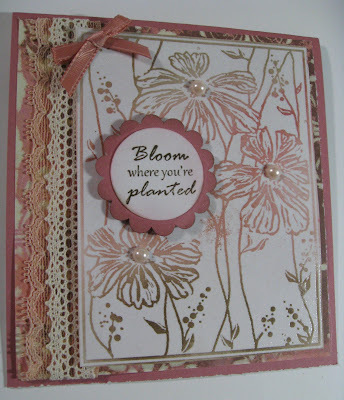 The label for the sentiment was created using the MS Optic Dot corner punch and a Spellbinders die called Labels 11. Gems and a celery green, satin bow were used for embellishments. This next sample is one of my favorites from Mary Anne this whole month, you know I'm a red and black girl! I always love tight croppings of large images on cards, like giving tiny magnified peeks into hidden worlds. The beautiful swirls and cut areas in the punches works so beautifully with the details in the stamped images. My base is Pure Luxury Black Onyx which has been embossed with a swirl EF from Tim Holtz. 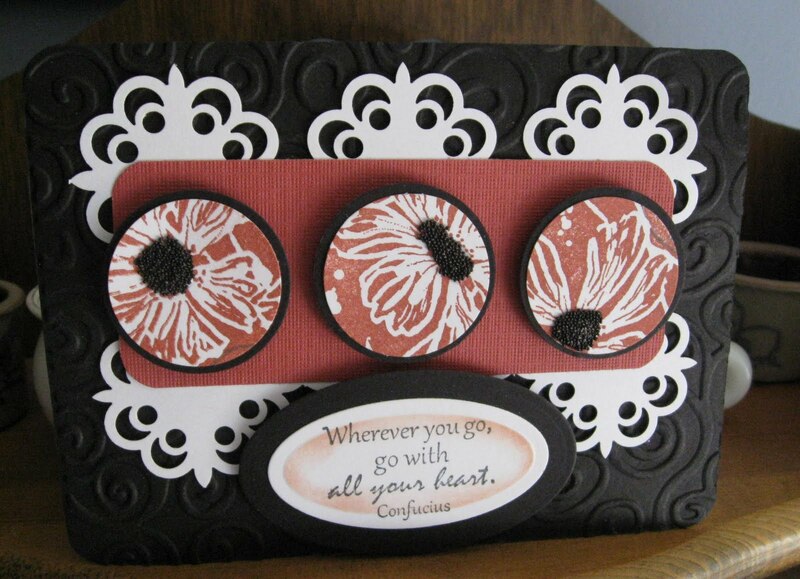 I used the MS Optic Dot corner punch to create a doily layer, and then added some red textured card stock. I inked the large Wild At Heart background stamp with a coordinating red chalk ink. Punched circles to capture the flowers and layered them on black. I added black micro beads to the flower centers for texture. My sentiment is popped on two layers of oval Nestabilities. Now without, further adieu, let's see what else Mary Anne has! "Wherever you go, go with all your heart." Go and have a GREAT day! Quick (and I mean "QUICK!") Card!! *I like submitting for this category when I remember to, because they are looking for simple designs, so I just kind of go with my gut and throw something fun and easy together, instead of some of the others I submit where I spend waayyyy too long questioning and fretting over the details of a more intricate design! Ther is so much talent out there, i really pray youeill not get discoruaged if you are still trying to crack thorugh that ceiling of getting your first card pubbed! I got so many rehjects at first, and I know it is easy to think, "well, this is my best work, if they don't like this then what chance to do I have!?" because I've been there, girlfriend! But keep at it, it's worth it!! I added more of the lace for yesterday's card, stamped the sentiment directly onto the frame in Vivid Brick and adhere it to a Pure Luxury Lipstick Red base. This was a very difficult card to photograph to capture the shimmer of the pearlex (for this reason I try to create top folded cards when I make a vertical design, but forgot here, oops!. As Is aid before, pearlex powders give you amazing shine and pearly texture, this product is also often called Perfect Pearls. On today's sample I used "Wild at Heart" stamped on white cardstock in Versamark and gold pearlex with "Lovely Labels" over it. The butterfly is from Hugs and Prayers. The bold silhoettes in this set go really nicely with this background. 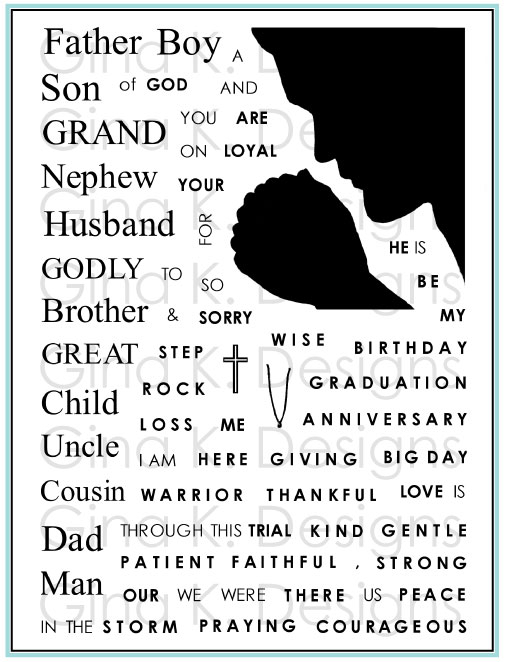 Blessings is cut out with a large oval punch. I cut out the middle of the label with an Oval Nestability to have the background peeking through to frame up the butterfly. Last I added some lace* and sateen flowers with adhesive nail heads to pick up the gold. Stamped frame is matted onto Pure Luxury Cranberry Tart and Good as Gold. Here is a pic showing me applying the pearlex, after stamping you simply dust it on with a large brush (any big brush will do, one you use for stenciling, for aplying makeup, etc, although I wouldn't use it for makeup if you use it with Pearlex LOL!) until the image is completely covered, swipe the excess away and then pour it back into the jar. Like glitter and EP, a little pot of this stuff will virtually last you forever. The gold looks amazingly rich. * So have you ventured into lace yet? This was my last scrap of a yard I bought at Jo-Ann, typically if Gina K doesn't sell it, I don't buy it! But I thought it would be fun to give lace a try. It is great to be to have them cut just as much as you want, this piece I picked out last month I thought would go particular nicely with the delicate flowers and tiny dotted buds in "Wild at Heart" and I was able to use on several cards (which I haven't shown yet, still waiting on those pubs!) so I will surly be getting more as needed... a yard of this was only about 1.50, went a long way and gives a lot of look! Haven't updated my slideshow in my sidebar in forever!! I was trying to add some new ones today and realized it was actually creating a new show, oops! These hows are easy to make and a great way to show your readers at a glance what's on your blog. Here are all the samples I have uploaded so far this month using "Wild at Heart". It has been such a joy to work with and I have actually held back sharing some of my favorites I've created with it so far (using a couple reeeeally cool techniques I have not shown here) because I have submitted them for publication, but I will find out soon if they are accepted! I'll be glad to have a few new ones for the blog because I am going to busy playing with my *NEW* set all week, it should be arriving any minute!! It coordinates with a past set (well actually more than one!) so I am just SO itchy to put them together, can't wait can't wait!! Welcome to our September Design Team Challenge and hop! Gina asked us to use our latest sets to create projects inspired by some of our favorite fall memories. I created two samples, using an Autumn spectrum pad to brayer over the "Wild at Heart" frame, stamping onto white and then die cutting a rectangle out of the center to create a frame for one card and a focal point for the other. Though they are not cards made for weddings, I was inspired by TWO fall weddings from the past, a favorite time of year to get married in Texas because it's not too hot!! 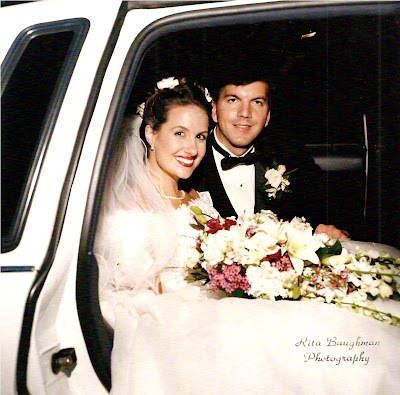 The first was inspired by my best friend from college's wedding, which was held at The Ladybird Johnson Wild Flower Center outside of town ten years ago. The ceremony took place in the evening and the limestone building were covered with flowering vines and had beautiful vistas overlooking the Texas sunset. I matted the window onto a larger Grass Green mat and then sponged yellow and orange inks directly onto the middle of my white folded card base to create a little sunset behind it. 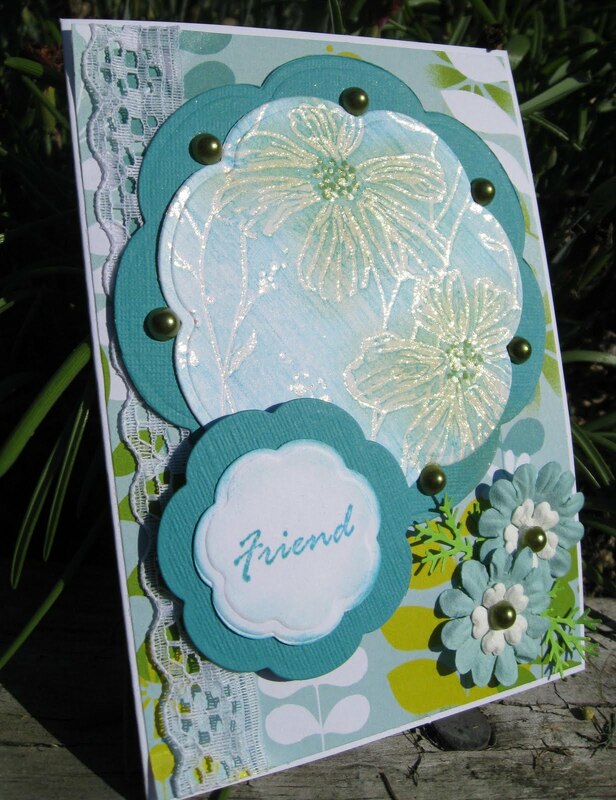 I added some large white flowers with button centers to give the card some dimension and added some of my favorite flourish punches to weave in and out through the opening like vines climbing a wall. This next card was inspired by my own wedding which took place in late September, our 11th anniversary is next week. Our colors were not quite this earthy (we did have fall flowers in our decor and my bouquet, though) but this card is for my husband so I want to man it up a bit! I used the cut out from the frame above then matted it onto a Pumpkin Spice layer I'd stamped tone on tone, lining up the images, then doing the same things on the Chocolate Brown layer, here you can see the thin border all the way around. Card base is Kraft. I added some neutral buttons and twine to the centers to give it some natural textures. I also decorated my envelope by stamping the frame again with Antique Linen. Miesje Flach - our CenterStage Spotlight designer! PS do you like this bigger type?? (I was rereading one of my posts the other day and noticed the font looked really tiny, don't need to cause anyone out there eye strain! ) Let me know! Good evening! 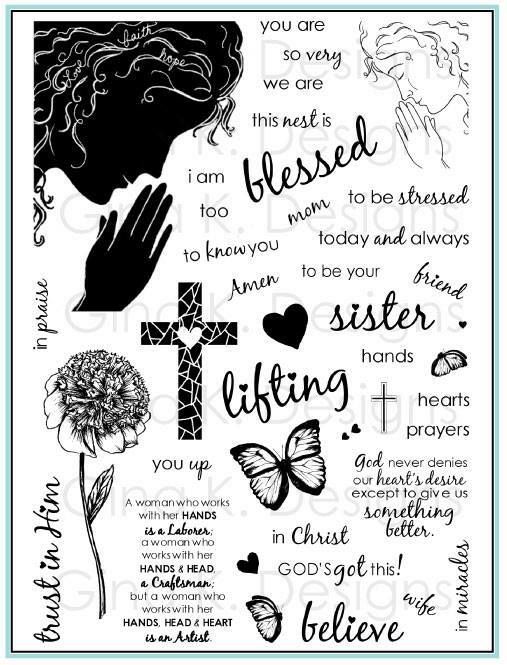 I love what Mary Anne is sharing with us today, breaking away from the rectangle frame and showing how lovely just a small die cut section of the larger image can be incorporated into any layout, you choose the sahpe and size! Match the colors you are using with some beautiful coordinating patterned paper and you have a fabulous design! I outlined the whole image with a Sakura Gelly Roll pen for sparkle. Good morning! Today I have a "Wild at Heart" sample using Pearlex powder, which is a crushed mica pigment. There are a lot of great things about Pearlex, it gives your cardstock a beautiful sheen and texture, and requires no heat setting (which I also love not having to worry about getting good coverage or removing all my stray flakes ahead of time the way you do with embossing.) The result is a pearly solid finish and cardstock that looks like a piece of stamped silk! I have another Pearlex sample I will be sharing with you soon along with a pic of how easy it is to apply, that one is on white cardstock, but today's shows one of my favorite things about it, how beautiful light powders show up over dark cardstock. Here on black this silver powder seems to create a "negative" of the negative frame. Simply stamp the image in Versamark and brush on the powder. It sticks to the Versamark the same way chalk does when you are doing poppin' pastels. 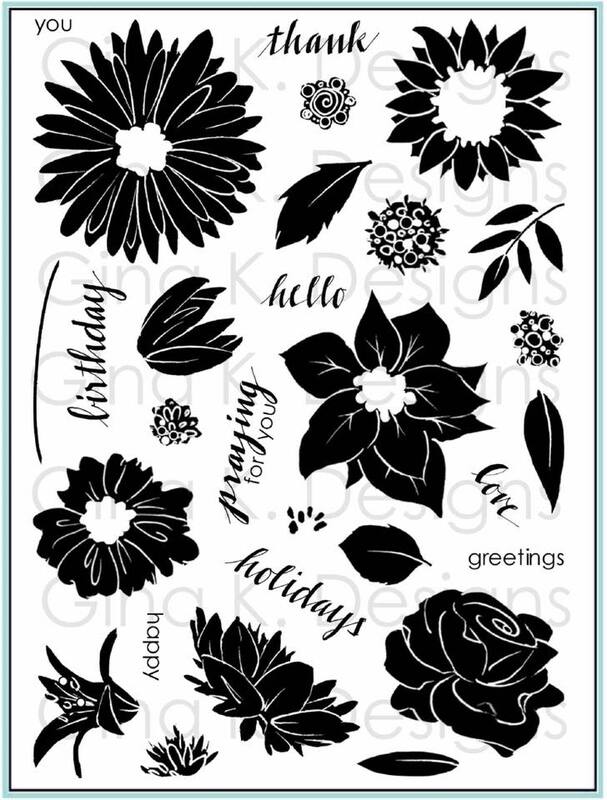 I stamped this onto Black Onyx and attached it to Silver Lining Pure Luxury Cardstock, and added a few tiny adhesive rhinestones over the little dotted buds. The die cut is Labels Nine. You can rub around the edges of the die like a stencil with more Versamark and add more Pearlex, but here I just used a little silver rub on paste. Here is another view of the card and this time I added some larger rhinestones to the flower centers I found at my LSS. This bling is so big they are almost like mirrors LOL! Here is a quick card with "Wild at Heart". I stamp it in black onto glossy white, the glossy paper makes it hard to photograph without catching the glare, but in real life this print looks super sharp and crisp and on the ultra smooth specialty paper, which also intensifies the contrast of the black and white. put them together with some gingham and Wild Dandelion Pure Luxury, and you just have a happy happy combo! A dear friend of mine went to lunch with me on Friday and told me how God had been at work in her life, after a story she'd heard from another friend about a woman who was shot in the eye by a stranger and heard a voice inside her head as she sat dying , "Right now, you need to thank the Lord." So she did, for everything she could think of as she believed her life was slipping away. If you are a believer, you will probably not be surprised to hear that she lived (but she lost her eye). The doctor said it was a miracle, as though the bullet was suddenly stopped and changed direction, exiting through her neck below her ear instead of continuing on its trajectory going through her brain. My friend said that now whenever she felt the urge to complain about something, aloud or in her head, she instead remembers to thank the Lord. In turn, she is rewarded with peace. It's true: at any moment when something big or very trivial threatens to crush our spirit we can choose to stop and count our blessings, and we all have so many when we decide to focus on the good things. 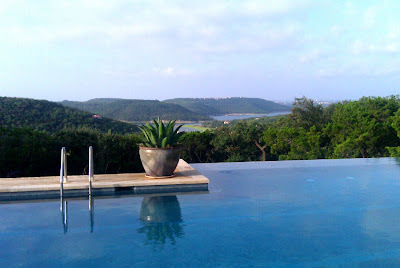 Later that day, my husband and I ventured out to The Crossings Wellness Spa just outside of town, the only time we have ever left our children overnight with the neighbors! I'd bought a half off coupon a few months back for an overnight stay there that included breakfast, so I'd been looking forward to having a chance to take my husband there. (I went once with a friend 3 years ago and the prices have gone up astronomically since, so I thought this might be the only time I'd go again!) It is lovely, out in the hill country with an amazing infinity edge pool. Of course I prayed beforehand that our kids would be safe and that we would have good weather! My husband didn't see the shooting star. I don't know if anyone else by the pool that night noticed it either. When I commented on it, he said it would be great to have a telescope out there, but I'm sure we'd have missed it if it hadn't been pointing in that direction. You had to be looking, at the right place, at that right moment. Don't forget to take time to stop, and to look! 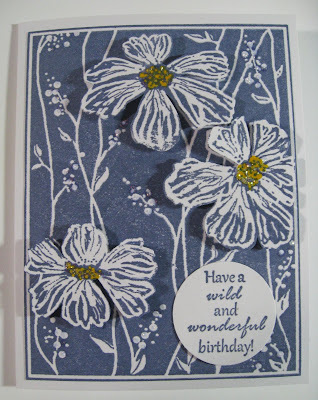 Today Mary Anne sent me this simple, single layer card with "Wild at Heart", stamped in chalk ink straight onto the white card base. If you've never seen these chalk inks in person, they have this gorgeous soft opacity. 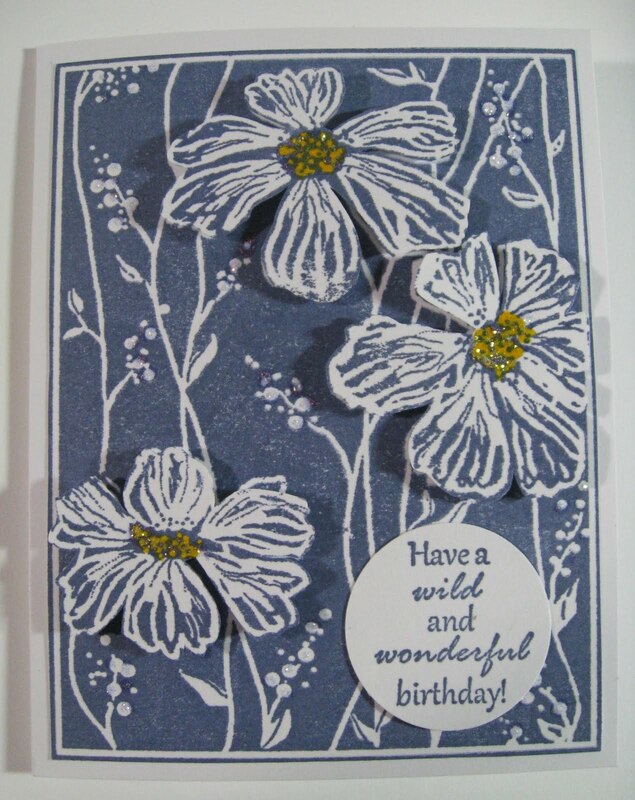 On white here with the yellow centers, it gives off this wonderfully casual "blue jeans and daisies" feel! 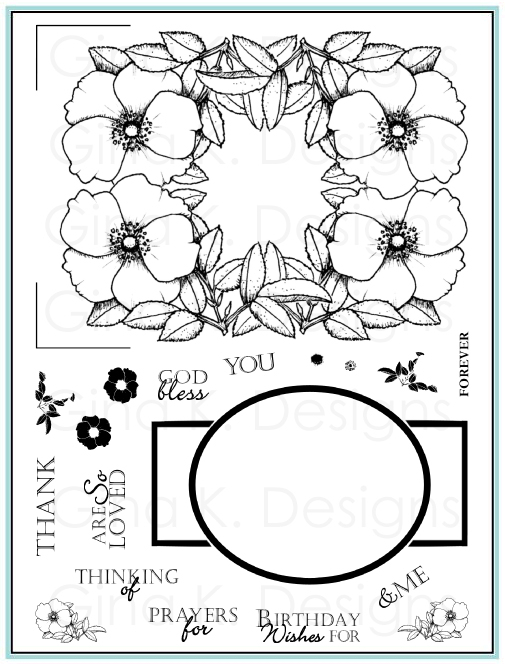 Stamp the frame again and cut out each of the flowers and pop them up to add lots of dimension and interest without adding lots of mats. 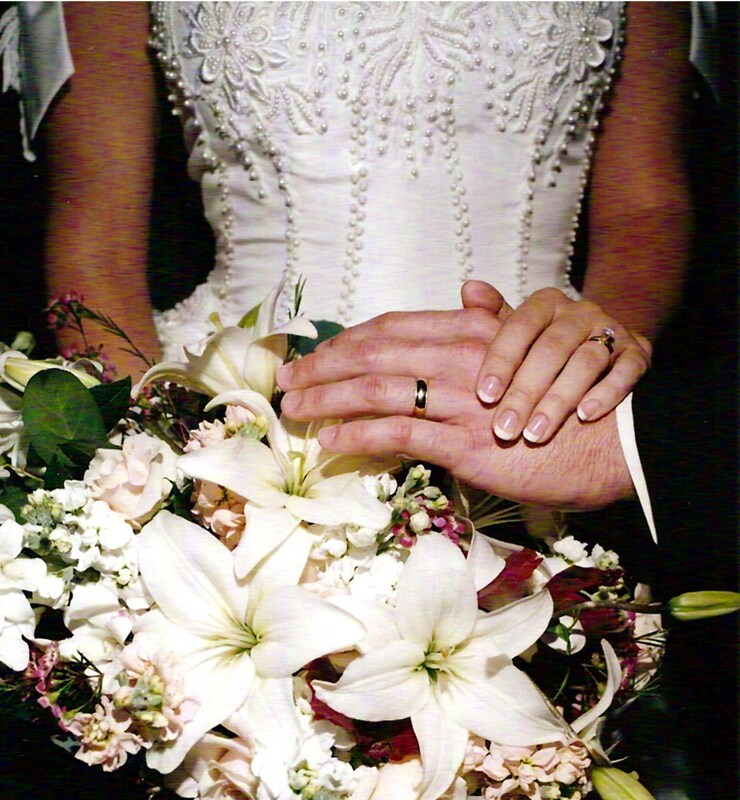 Keeping with the simplicity of the rest, a plain white round tag is perfect for the greeting. Now let's go see what else Mary Anne has for us! I haven't seen it yet, either, hee! The second is one of my favorite 3-D projects e-v-e-r (on their website, in the pic at top! can you see??? squint!!)! On page 91, it uses "What's In Your Tin?'' as well as Gina K's "Comfort & Peace" and "Hope is Faith". This inspirational tin is for a caregiver and I couldn't think of a better place to have it on display than next to the beautiful friend Carolyn King and her Mamo, with an article focusing Carolyn's grandmother's battle with Alzheimers and and profits from her stamp designs going to the Alzheimer's Association! Thanks for letting me share my news!!! Start out inking the "Wild at Heart" frame in light pink. Then take the small bold circle from "Inspiration Mosaic" and the large bold circle from "Hip to Be Square" and stamp them in bright pink and then in Brick Red over your pink, inked stamp. Be sure to go off the edges to create a continuous pattern and don't be afraid to overlap them. Now stamp onto white cardstock! Don't you love that flowers showing through and all these bold circles bubbling up?? 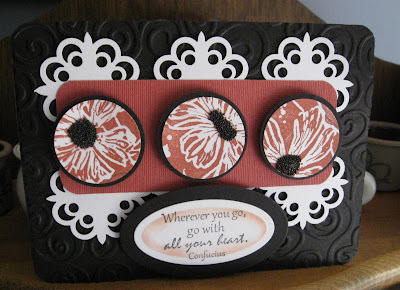 I repeated the circle element with the ginormous Gina K buttons, embossed circle tag, and embossed the Chocolate Brown layer with Seeing Spots folder. Base is Innocent Pink. Hello! Hope you all had a fabulous holiday weekend!! 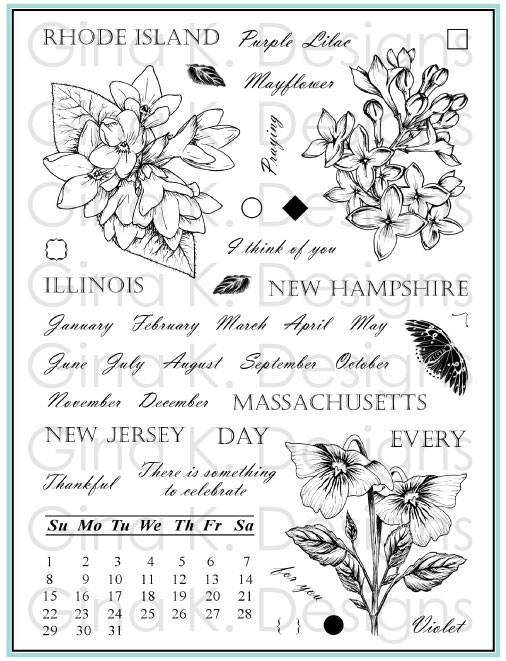 Today's "Wild at Heart" sample uses one of my favorite "tool stamps" in the Gina K Designs collection: the crackle image from the "Bold Flowers" set. It adds the most beautiful natural texture to your cards. First I inked up the frame in Vivid Tuscan Tan. Then I inked the crackling image in olive and stamped (kissed!) it all over the frame, reinking each time. Once I covered the entire frame, I huffed on the frame and pressed it onto Pure Luxury White. Love that beautiful marbling effect, it almost looks like stone! I layered it onto Fresh Asparagus and Soft Sand. (looove these colors together!) The middle strip I just placed a piece of Fresh Asparagus over the middle of the olive inked frame, and then lined it up with the mat behind it, isn't that pretty, looks embossed to match! I cut out the greeting with a Nestability, which I lightly sponged on just the bottom, for a subtle airy effect. I'm really digging this layout with this set! Button and ribbon are also Pure Luxury. I also stamped my white envelope with the frame in tan for a coordinating ensemble. Looking forward to chatting with you more this week, have lots to share, pics and personal stuff! Hugs, thanks for visiting me! 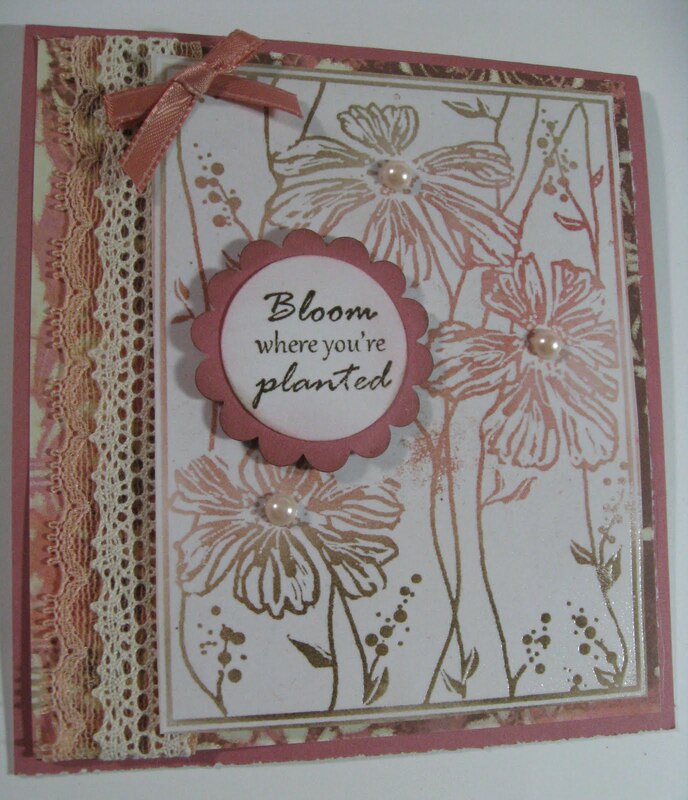 Today Mary Anne Kelemen has created this beautiful, shabby chic sample with "Wild at Heart". She's used the emboss resist technique of embossing the frame on white, then sponging Walnut Stain and Worn Lipstick Distressing inks over the image, filling in the flowers and stems. I love how the brown fades to rose then back to brown again. Aren't these color amazing? Two kinds of lace and delicately patterned paper peep out the sides of the frame on this large square card, and pearls adorn the flower centers. A tiny bow finishes it perfectly. Now let's go see what else Mary Anne has for us today!